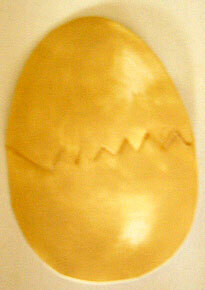 Homemade Easter greeting card in the shape of an egg which opens out to reveal a cute little chick. Yes! It's time to celebrate Easter. Why not make a few of these easter egg greetings and send them to surprise friends and relatives. I'm sure they will love it. 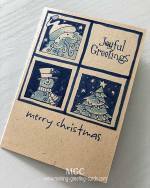 This greeting card design is simple to make. Just follow the free printable template that I have provided and you should not have any problem duplicating it. 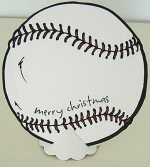 You can make this card with kids too. They will love to color the egg and chick. And it's okay if they color outside the line because you are going to trim around the pattern anyway. This is the front of the easter egg. I used skin color tone ink from a ink pad to color it and leave some white spaces to give a 3D effect. This is how it looks when you open the top half of the egg. Here's how the inside looks like. Print out the Easter Card Template on white photocopy paper. 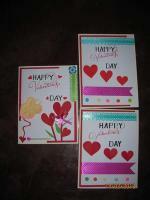 Place template on the cardstock with the left fold line flush to fold of your cardstock. Color the front of the egg with skin tone color ink or paint. 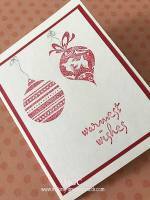 Transfer the design for the chick onto another white cardstock. Color the chick with yellow marker. Draw in the eyes with black marker and the beak with orange marker. Cut the jagged middle of the egg until fold line. Cut the chick and snip on the edges. 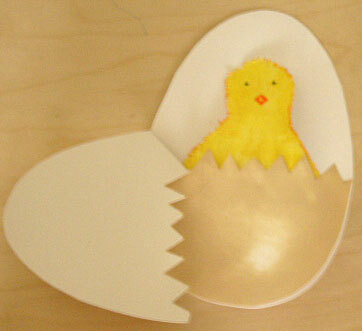 Attach the chick to the back of the bottom half of the cracked egg with double sided tape. 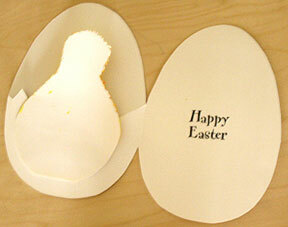 Finally, ink Happy Easter rubber stamp and stamp the message on the inside of the card. Do not open until Easter | Easter Blessings to You!